Update: Apple has now confirmed that this is indeed the ‘iTunes announcement” teased on their site yesterday. Full Apple press release below, if you’re interested. While this is a little ahead of the iTunes announcement slated for 10 am EST, we just got news that the entire Beatles catalogue has been made available on iTunes. We aren’t entirely sure if this is the iTunes announcement that will be made later this morning, but wouldn’t be surprised if it is. You can now get the entire Beatles back catalogue here for $12.99 per album or the entire catalogue for $149. The “boxset” for $149 includes all 13 studio albums, iTunes LP with mini-documentaries, Past Masters, notes, photos, and extras. There are also a number of notable features on the Beatles iTunes page including a “highlight reel”, ads, and the first Beatles concert in the US from 1964. 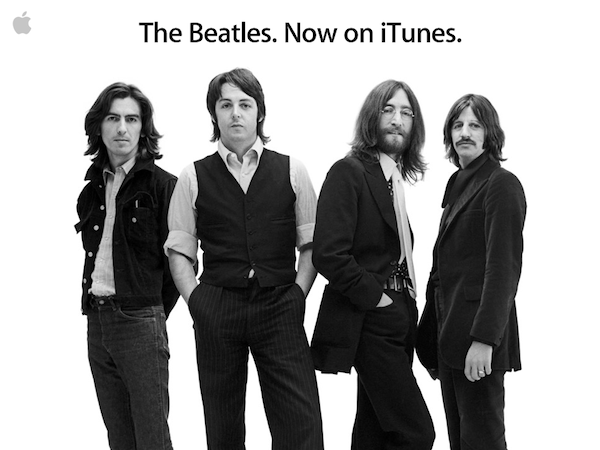 You can check out the Beatles iTunes Artist Page here. While many thought an iTunes cloud service would be announced, chances are Apple would save an announcement that big for a live press event.